It's funny, but I can't think of a single book that I haven't re-read. There are very few books that I read just once, usually only those that I don't like. I can't sit still without a book in my hand - even while I am having dinner or watching television; which is when I usually read books that I've already read before. That way I can read, and I won't snap at anyone for disturbing/distracting me! Every time I re-read a book, I enjoy it more. For two reasons - one, I think of the fun I had reading it the first time and compare what I felt then, to what I feel now (now that I know what is going to happen next!) Another reason is that for fast paced books or those with a complicated plot, I can focus on the writing, in a way I would have never managed the first time! I don't read the entire book again, though - I usually re-read it in parts - parts that I liked or parts where something important happened! 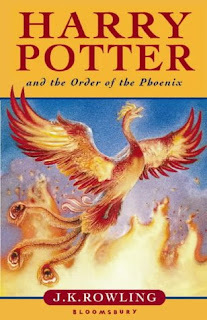 I can't remember the first book that I re-read, but the one that I read the most number of times has to be the entire Harry Potter series (The fifth book the most, though it's not my favourite!) I never kept count, and I couldn't have even if I tried - let's just say, I can recite the books if I wanted to, that's how many time I've read them!! Still need to read this! Actually, everything from Goblet on is on my TBR. You point out some good reasons for rereading. Thanks for stopping by my BTT post. Abookandashortlatte1 - You should read them all soon, they're awesome! !